You can view a short demo of an ACPEN webcast here. ACPEN courses are created and presented by experienced presenters, renown experts, and seasoned practitioners. The ACPEN Signature courses are presented in broad topic panels, while the Specialized Area courses tend to be lead by fewer presenters, focusing on specific areas of industry, tax, and financial planning. All ACPEN courses include downloadable written materials for use during and after the course, and live credit is awarded for all Live Webcasts and Live Webcast Replays. In addition, questions may be submitted to the presenters at any time during the course, and technical support is available during all courses, to ensure you have a great experience. 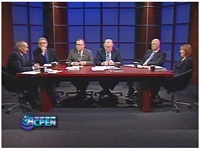 ACPEN courses provide relevant content, presented in an engaging, discussion-based format. We hope you’ll join us for the highest quality online CPE available.